A San Francisco Sweep ~ The Bucky Channel - The World of Sports from Wisconsin's Perspective. Before we begin, we need to remember that the San Francisco Giants aren't very good. That being said, how good do the Brewers look right now? Milwaukee finished off a sweep of the Giants with a 7-0 victory, led by the outstanding pitching performance of Ben Sheets. There might be nothing I like better than watching Ben Sheets throw a complete game, and especially a shutout. From the moment he stepped off the mound after a 3 strikeout first inning, you knew he was in for a special performance. He finished the day with 8 strikeouts and 5 hits, although the Giants never advanced farther than 2nd base. At the plate, the Brewers once again went with the pitcher in the 8th spot and Kendall batting 9th, and as much as I hate to admit it, so far it's been working in the Brewers favor. Although today, Sheets did leave 7 men on base as part of batting in the 8th spot, but it didn't really matter as every positional player had at last one hit today, including Ryan Braun, who was a triple away from the cycle. Braun had a home run just two batters after Gabe Kapler hit one of the park in the 5th inning. We won't know the true potential of this lineup until Mike Cameron is back, but in the meantime, Gwynn / Gross / Kapler have been nothing sort of amazing. After one week of baseball, the Brewers look scary good right now. I know they've started hot in recent years and cooled down later, but they are consistently not only putting runners on the bases but also getting quality performances out of their starting and relief pitching staffs. 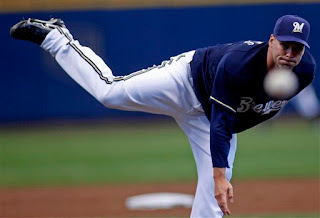 Granted, a win against Barry Zito isn't saying much these days (he is absolute garbage for an arm right now, unbelievable), but the Brewers look sharp nevertheless. This is going to be a really, really fun year kids.